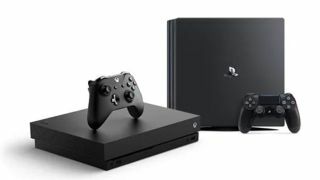 The best PS4 and Xbox One deals 2019 | What Hi-Fi? On the hunt for a new games console? You've got a few options when it comes to picking console deals. The PS4 and Xbox One S are a little older so they tend to be cheapest, with the 4K capable PS4 Pro and Xbox One X sitting at higher price points. Whichever you go for, expect the offers to include an extra game or two bundled as part of a package. You can pick up an Xbox One S with a game for around the £250 mark. An Xbox One X with a game can be yours for just over £400 with the console on its own around £380. Or if you're a Sony fan then the PS4 with a game sits at around the £250 mark while the PS4 Pro plus a game is nearer to £350. In terms of retailers there are plenty of options, many of which are the usual suspects. Argos, Game, Currys, John Lewis, Amazon and AO.com all tend to have something to offer. These deals are what's hot right now, with a mixture of console only and console plus game(s) bundles.